It happens every week. As I'm selecting my Swiss chard, kale, or collards, someone inevitably sidles up to me and asks, "What do you do with that?" Then after I share a recipe idea, she usually follows up with, "To me, they're all the same." No wonder people get confused. Every time you go to the supermarket all the winter greens are mixed together in one big, undivided, forest green section, with seemingly randomly placed signs and prices scattered above and below them. It's like a game: Match the green on the left column with the correct name and price on the right column. Chances are you probably just select the green that your mom made when you were growing up because it's the one you actually know how to cook. Well here's a tip that will make you look like a savvy supermarket shopper. Buy red kale. It's the one winter green that you can always correctly identify. Red kale has red tinged curly, oak shaped leaves with a dramatic purple vein down the center. There's no mistaking it for collards. So next time you're at the greens section and everyone else is desperately trying to figure out what's what, casually stroll over, pluck a head of brightly colored red kale off the shelf and place it in your cart. Don't hesitate or glance up at the signs. Stay cool. Then head to the check out aisle. Mission accomplished. Red kale is a type of Russian kale that is super high in vitamins K, A, and C and may even help prevent cancer. 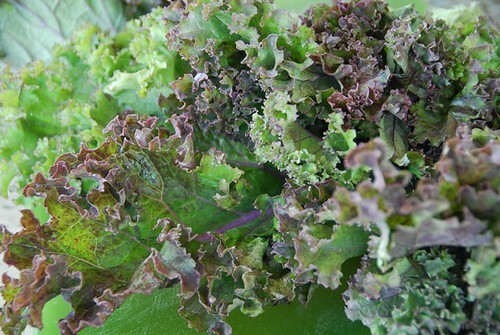 Unlike other members of the brassica family, such as green dinosaur kale and mustard greens, red kale's flavor is more sweet than bitter, and its leaves are more tender. Red kale can be eaten raw in salads or it can be steamed, boiled, or sauteed. If you have a small refrigerator and don't want to take up half a shelf with a bunch of kale, then par-boil it and store it in an air-tight container for up to 5 days. This healthy Indian-inspired red lentil soup is enticingly aromatic and flavorful. Top it with a garnish of toasted coconut and chopped peanuts for a little crunch. Heat olive oil in a medium saucepan over medium heat. Add onion, carrots, and celery; sauté until golden, about 5-7 minutes. Meanwhile bring a large saucepan of water to a boil. Add kale; boil for 2-3 minutes, then drain. (This will make it more tender). Add drained kale, lentils, chickpeas, and broth to the carrot mixture; bring to a boil. Cover, reduce heat to low, and simmer 12-15 minutes or until lentils are tender. Pour half of the lentil mixture into a blender; let stand for 5 minutes (so the soup will cool and not cause the cover to pop off!). Pour pureed lentil mixture into a bowl, and repeat process with the remaining half. Once the soup is blended, return to the pan; add coconut milk, spices, ginger, and salt; stir well. Cover and simmer for about 10 minutes or until thoroughly heated through. Remove from heat; season to taste with salt. Ladle soup into bowls and garnish with toasted coconut and peanuts. Thanks for the primer on greens... I am definitely a novice in that area. 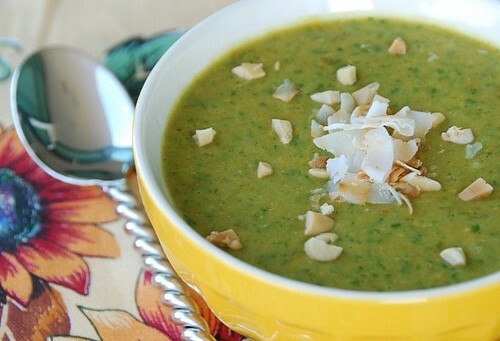 Your soups always look so great - and just in time before the weather really warms up (at least here on the east coast). Lovely soup - this might be a project for that tub of yellow mustard seeds in the cupboard that are as yet untouched. I like the addition of the coconut milk to this. Looks so healthy! Thanks for the recipe and to tell you the truth, I always pass the kale at the grocery not knowing what to do with kale. Beautiful soup. oh, so that is called red kale? they grow like mad in our garden, self-seeding! i usually just use it for salad, a bit bitter, but it's just for the goodness it's carried, I suppose :) interesting idea using it for soup. should try that one out. What a tasty looking soup! Lovely!! i've become a fan of kale and have also posted a couple of kale soups lately. ohhh. kale, lentil and curry?! what a wonderful combo. beautiful pics, too! I love Red Russian Kale, and I was a bit of a slacker about completely removing it from the garden, so I'm hoping it might re-seed for this year. The sounds sounds completely fabulous. I'd love to have this for dinner any night! I laughed out loud while reading this post because EVERY time I shop, people ask me what I do with my ingredients... in fact, that is why years ago, I decided to teach cooking classes. What a great tip! And this soup look so delicious. I love soups. They are so perfect for the winter season. Yum! And I thought I was the only one! The other day I was at the store and was asking the produce guy about which green was which and he didn't even know. Kale and collards are all greens I see on so many blogs, but they're not available here. Though different types of lettuce are visible at my market these day. Kale and soup are good friends in this household, but I've always used the kale in clear soups. Curry, lentils and coconut milk? Be still my heart! I will certainly give this one a go! Your soup look so delicious and such a healthy soup too!! I need to figure out more greens here... There aren't as many, and some are totally unfamiliar to me. And I need more winter greens! I posted first recipe "stollen" from Jamaica today... I plan to make patties tomorrow and some more things later this week. I wish I had easier access to some of the ingredients that are really hard to find here... I spend all day today looking for annatto seeds, with no result. That looks terribly good Susan. So here's one more recipe for you to try with kale next time they ask you... :-) Caldo verde , a portuguese kale soup with potatoes and chorizo. I am yet to experience eating Kale. Kale sauteed with olive oil and garlic is a slice of heaven! Kale always makes me nervous. I have only used it as a garnish, but that soup looks amazing. I really have to try this! Oh sounds good--they plant kale here in the medians with the begonias and dahlias every summer. As a decorative thing but it always looks strange to me and I wonder how the moose don't eat them. Great post! I must look out for it next time I'm shopping. michelle-I love dandelion greens too, esp.in salads. michaela-I'll have to check them out. kalyn-Oh, that would be lucky! louise-I hope you like it! margot-Really? You've gotta try it. cythia-I hope that changes soon! chuck-It's really good. I hope you give it a go. not martha-You're a native RI too? Yay! I had never tried kale and fell in love with it this summer when I got it from the CSA. I would make a meal out of a quick sautee. It was delicious! My problem isn't so much identifying winter greens--it's remembering to buy them! Which is a shame, because they're so good and good for you. Thanks for the beautiful reminder, Susan. I am not sure if we have kales in Greece but the soup sounds perfect. i've been cooking kale every week for the past few weeks. just love it. your recipe looks really hearty and healthy. tw-I love it like that too. Especially with some toasted bread on the side.